Attention parents of the planet earth! We have an important message to relay. You see, we just got a communique from the galaxy far, far away. And it came in from some remote planet out on the outer rim. They've sent a very important note to let us know that Boba Fett is no longer able to perform his duties. He's been swallowed whole by some kind of creature called a sarlaac! Welp, we know what that means! We need a new Boba Fett. Of course, we don't even need to traverse to the Star Wars galaxy to find a candidate. Because there are plenty of nominees right here. We're thinking you might even have one in your own home! Think you do? We're sure your kid would be great! Any boy or girl is sure to love to love the adventurous lifestyle of a bounty hunter. And having them becoming a bounty hunter with the prodigious reputation of Boba Fett himself? Well, that's almost too good to be true. But it's not! Because we've got this Boba Fett Muscle Chest Dress Up Box Set, ready for your kid! Star Wars officially licensed, this costume comes from right here on earth, and as a matter of fact, it's made in the USA! This dress up set is a fun alternative to a typical costume; it comes with a shirt, cape, and mask for simple costume fun. Foam padding on the chest replicates the famous armor from Boba Fett's suit, and the molded plastic mask looks just like the real deal, too. 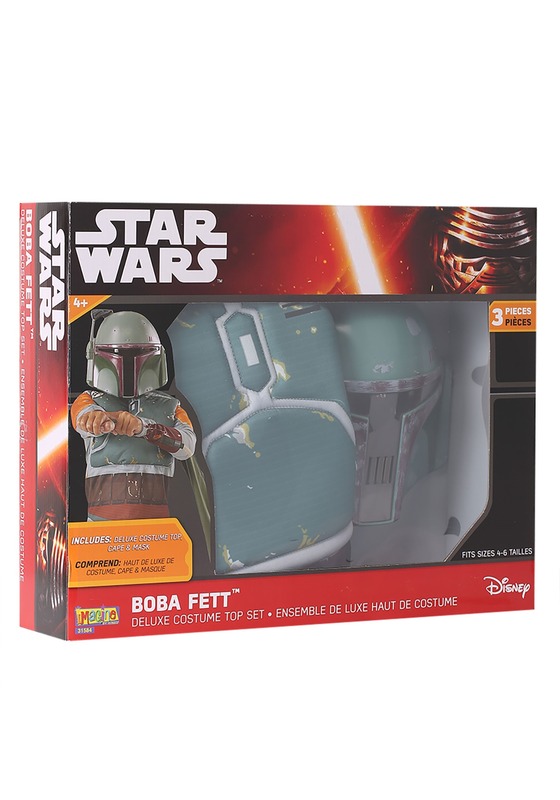 For bounty hunting, Halloween fun, or just for afternoon play time, this Boba Fett Box Set can't be beat. And face it, it's not such a bad proposition having a bounty hunter right in your home, is it? It's sure to keep the rebel scum and riff-raff out of the house, at least!